Not being a farmer myself, I am always guessing what topics sugarcane farmers would like to read about and trying to affix some reality to my assumptions. 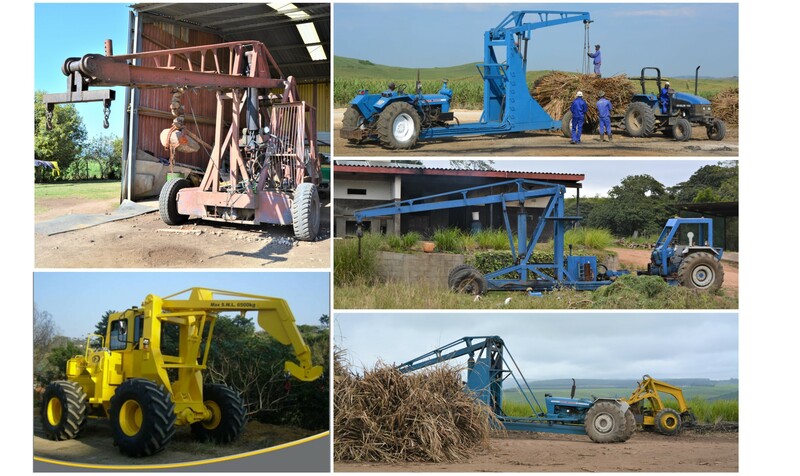 Whilst in Mpumalanga, it was mentioned that farmers in this region were currently interested in the loading options on offer and I grabbed the hook immediately … so here goes – a look at the loading options currently available to South African sugar cane farmers. A loading system is not selected in isolation and depends on other factors in your operation. In turn, the loading system you choose will affect other facets of the business. As such, it must be viewed and assessed as part of a whole. Every operation differs on so many levels that it would be futile to try and prescribe what’s best for each one, so instead we will display the options and associated costs of each. The cutters cut the cane manually and pile it up into stacks. These are loaded onto trailers (either one or two per trailer) and hauled by tractors to the zone. Here it is weighed when the tractor crosses a weighbridge or by a scale attached to the crane that takes the bundle off the trailer. Cutters are paid per tonne. It is then either spilt onto the zone and grabber loaders transfer it to mill-bound trailers or the bundle is kept in chains. Bundled stacks are either immediately placed into the mill-bound trailer by the same crane that weighed the bundle or they are stocked for when the mill-bound trailer is available for loading. The cutters cut the cane manually and place it in windrows. They are paid for the distance they cut. These windrows are loaded into mill-bound trailers by either slewing (when the wheels/tracks face one direction and the manoeuvrability is in a slewing arm) or non-slewing (typical of tri-wheelers, where the whole machine is a fixed unit with manoeuvrability being in the wheels) machines. Mechanical harvesting: Harvesters harvest and transfer the load into mill-bound trailers. Capital cost of equipment required. Yield loss: the impact on subsequent crops. This is an area that we don’t automatically factor into our decisions but one that can carry a substantial cost. The plants that are in the ground, under the harvesting and/or loading equipment, are the same plants from which we expect optimal yields at the next harvest. The damage from heavy equipment will impact the yields going forward. If the same plants are compacted and damaged again the following year, the impact on yields is compounded. This fact was also discussed in our recent article on fertilisers. We cannot afford to think only about the crop going into the mill without being cognisant of the impact on the next crop, and the one after that. When it comes to loading, two factors can cause subsequent yield losses: one is damage to the ratoons (when a vehicle drives over the rows themselves) and the other is soil compaction (this can occur on the rows and on the inter-row where the plant roots go to access nutrients and water). An interesting fact about soil compaction is that 70% of it occurs in the first instance ie: all you have to do is drive over a piece of earth ONCE and you’ve inflicted 70% of all the damage. Every subsequent pass is less and less impactful. Therefore, the trick is not to minimise in-field traffic but to eliminate it. I saw you roll your eyes to that … we all know that in-field traffic of some degree is unavoidable. Sugar is a high mass crop and it has to get to the mill. Machinery in-field is essential. But that traffic can be controlled. If you’re going to allow vehicles and equipment into a field then make sure that there are select ‘roads’ and that everyone sticks to those ‘roads’ when going in and out of that field. That way, you cause maximum damage to a far smaller area than if you take a new ‘road’ every time you drive in or out … Obviously, the less the in-field traffic and the more controlled that in-field traffic (limited to inter-rows or only select inter-rows) is, the lower this yield loss will be. Farm size and budgets usually go hand in hand: If you only have 50 hectares and are limited in terms of maximising machinery capacities, you may be forced into making the best of what the local contractor has to offer. If your farm is so extensive that it precludes manual harvesting, then mechanical may be the only way to go. Terrain: Self-loading trailers, popular in cut and stack, are usually side-loading. Their gradient limitation sits at 25’ but the cutters can carry the cane to a suitable collection site if necessary. Non-slew loaders are limited to a 40’ gradient and slew loaders to a 20’ gradient. Personal priorities: If soil health and sustainability are where you hang your hat then you’ll be looking at the minimally mechanised options. Distance from the mill: Last year I visited Ludick Delport on his farm, Baobab Trust, in Pongola. I swear we could have walked the cane over to the mill it was so close. In cases like this, stacking first, then taking the cane to a zone to be rehandled into trailers for the mill would have to be justified by substantial gains in the yield loss department to warrant the effort, time and additional labour. Tractors: Most farmers have a couple of these and there are endless options both in terms of retailers from whom to buy the tractors and other jobs the tractors can do around the farm. I hope you’ll all agree that we cannot assign a high cost to these. Trailers: Specialised side self-loading cane trailers can be commissioned at just about any steel shop or even made yourself, as we learnt when we interviewed Rustin Curtis. He built a break-neck side loading one in 2005 for R 55 000. A new, single-bundle self-loading break-neck trailer will cost around R180 000 to R 220 000 today, making it affordable (in the grander scheme of things) but, as it is a specialised piece of equipment, we’ve assigned it a moderate cost rating. Rustin’s break-neck, side loading trailer he built in 2005. Attachment on the bundle loader. This goes between the boom of the loader and the cane bundle and costs around R30 000. Cranes / bundle loaders: These are also specialised items used to transfer the loads into the transport trailers. As can be seen below, the configurations are endless with most being an adapted tractor. A new one of these costs around R380 000. If the bundles are spilt onto the zones. Farmers do this if they feel that loose cane, loaded by a grabber, maximises payloads better or if loading for the mill is run as a separate operation, time-wise. Vince Drew chooses to do it this way because it happens at night, freeing the days up to focus on harvesting. To clean up the zone. A nice-to-have in terms of getting the WHOLE harvest to the mill and keeping the zone tidy. Of all the methods available, this one is dear in terms of labour. On average, cutters productivity is in the region of 4 to 5 tonnes a day for burnt cane. This translates to R35 – 45 per tonne but is partly offset by the lower capital investment requirements and the costs associated with yield loss due to compacted soils and damaged ratoons. But, we also need to factor in the requirement for labour on the zone (loader operator). Running costs. Low. The tractors, trailers, cranes etc are all simple pieces of equipment, low on the scale of maintenance and running costs. Special focus needs to be placed here in order to manage the potential delays. These can range from minimal if stacks are removed from the field on harvest day, weighed on zone and placed directly into waiting mill-bound trailers, to damaging, if stacks are not moved quickly and there are delays on the zone. Theoretically, cut-and-stack should rate really well in terms of being low in this cost sector but, the reality is that it is often poorly managed and high levels of uncontrolled traffic happens (even over the rows). The graphic below illustrates my point. to ensure that tractors and trailers access the field on inter-rows only. No driving over the rows even to access or leave a field. NB: row spacings need to marry up with tyre spacings. The same bundle placement and ‘roads’ are used year on year, ie: this field only has 4 ‘roads’ and access down any other inter-row is forbidden. Of course, this means that rows have to be visible which can be a challenge (but not impossible) in green harvest fields, drivers have to be disciplined and cautious. But, if all these recommendations are followed, you can minimise the unnecessary negative impact on future crops. 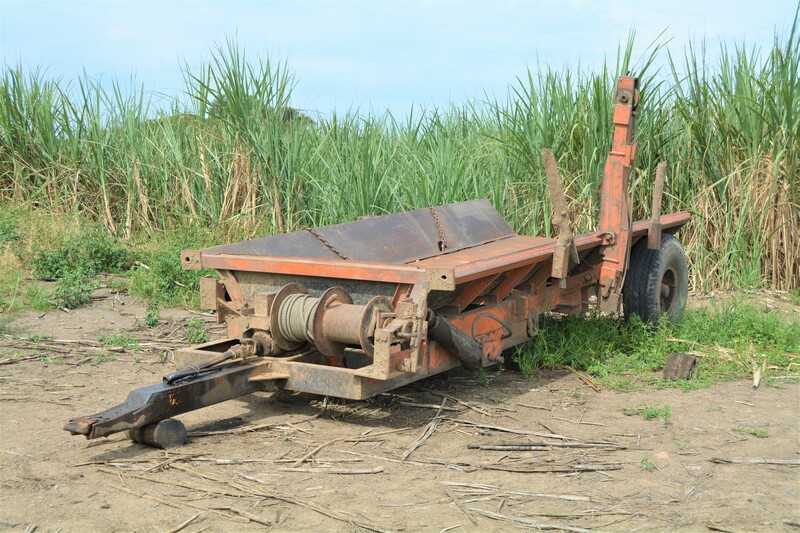 Windrow harvesting is a quicker method of harvesting and loading as the cutters do not need to stack the cane in a bundle; they simply base and top cut and lie the cane in a windrow. Nifty three wheelers (non-slew loaders) move down the rows, collecting the cane in the grabs and then placing it in the tractor/truck-drawn trailer that accompanies it in the field. These trailers are either high-capacity ones, destined directly for the mill or smaller ones that will dump on zone. A Bell tri-wheel, non-slew loader is iconic and almost as much a part of the sugar industry as the cane itself, with the first one having been built in 1964. Hintech, an Austrian company, began offering tri-wheel non-slew loaders to the sugar industry following their success in the logging sector in the early 2000’s. 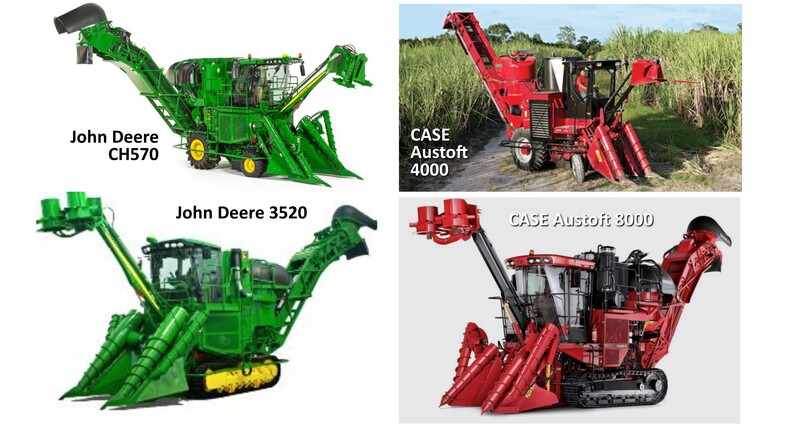 As far as I can ascertain, these are the only two suppliers of specialised sugar cane, non-slew grabbers and loaders commercially available in SA currently. And then there’s the tractor requirement – we’ll be needing a slightly larger one if using high-capacity trailers in-field. Loading directly into mill-bound trailers negates the need for the smaller trailers, saving a piece of equipment when using this method of loading. Labour: The cutters are more productive, not having to stack. They can almost double their output, getting through an average of 8T per day and their rate is around R21 per tonne. We do now have the need for a skilled loader operator though. Running costs: The costs of running larger tractors and bigger trailers are probably offset by fewer trips into the field. A crane is no longer required on the zone but the loader in-field is now an essential – another offset. On the whole, the running costs are probably not significantly higher that C&S. RV loss: Lower – the single handling cuts back on time delays and therefore RV loss. This is the biggie. Tri-wheelers and controlled traffic are completely foreign to each other. Although the truck/tractor and trailer might do its best to remain in a ‘road’ thereby inflicting soil compaction rather than ratoon damage, the almost-5-tonne loader was built with manoeuvrability and speed in mind and both compacts the soil and damages ratoons. So, although windrow harvesting and non-slew loaders have their benefits, yield loss isn’t one of them. Slew loaders have been borne from the challenges of non-slew and have addressed those issues perfectly. The tyres now stay in the inter-row, reducing damage to soil compaction in the inter-row only (provided the field has been planted to couple with the equipment used). The slewing arm of the machine provides the manoeuvrability element. Everything else, in terms of windrow harvesting and single handling stays the same, it’s just the all-important ratoon damage that has been addressed. Safe Lift capacity 650KG 850KG ? ? Ground clearance 0.45m 0.48m ? ? Clearly these cost a tad more than the three-wheelers but they save on yield losses in subsequent crops, especially if they keep to the same inter-rows year on year, drive cautiously through the field and their wheel spacing aligns with the inter-rows. The variable costs of operating these machines, with their larger engines, articulation and slewing capabilities, are slightly higher than the three-wheelers. The manufacturers (CAT, Hyundai, Doosan, Komatsu, Hitachi, Volvo … ) and models are extensive (approx. 7 options for each brand) and you need to source the grabber as a specialised attachment. Getting information on them for use in sugar cane loading is not simple as they are primarily for the construction industry. I did learn that, when this equipment is supplied into the sugar industry, they typically reduce the width of the track and lift the rollers by 50mm (to get it out of the mud). They also fit a boom extension of 1,2m to facilitate loading of the cane trucks. A tropical radiator kit with vents in engine covers is also a recommendation in hotter areas. The radiators need to be cleaned of dust and sugar cane leaves regularly. Excavator – Komatsu was kind enough to assist with some specifications. Scale: Jan mentioned that an annual production in excess of 70 000 tonnes justifies a mechanical harvesting set up, financially. Context: The separation plant Jan’s business recently had a hand in establishing accommodates mechanically harvested billets only – this context further justifies mechanical harvesting investment as there will be income opportunities from the trash collected. Crop Care features Floating crop dividers. Contour base cutter height control. Floating crop dividers. Labour: This element is largely replaced by the mechanised setup. Just a highly skilled operator for the harvester and the tractor. Running costs: It is really difficult to quantify these but I am sure we can safely assume that it’s higher than any of the other methods we’ve investigated. RV loss: No more or less than the other single handling options. This has the potential to be very high because it is often very difficult to determine where a row is, especially when cane is lodged, in order to avoid it. With equipment this heavy, the ratoon damage will be extensive and even if the operator manages to stay on the inter-rows only, the compaction will be substantial. What are our current top farmers doing, and why? Steep areas: Cut and stack – weighed on a weighbridge at zone and tipped out. Flat areas: Cut and load in-field with a non-slew loader (Bell 125A) – weighed on a weighbridge at zone and tipped out. Dustin Cooper 62 000 tonnes Gledhow Mix of steep and flat Windrow placement with non-slew loaders loading in-field Farm is owned by a contract harvester. Low cost of harvesting by the business. Vince Drew 51 000 Sezela Steep & Flat 100% Cut and stack with bundles placed on roads as much as possible. Stacks weighed and tipped onto zone. Loose cane loaded with a Bell Loader onto trucks at night. 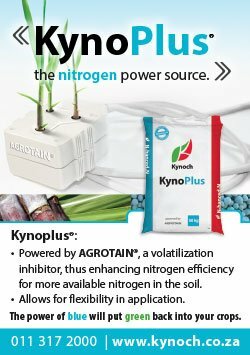 Prevent soil compaction and ratoon damage. Pat McBean 61 200 Umzimkulu Mix of steep and flat Cut and stack Community employment. Limit soil compaction and ratoon damage. Mark Buhr 45 000 Umzimkulu / Sezela Mix of steep and flat Cut and Load Most efficient. In line with minimum tillage practices. Pongola: flat Cut & Stack on steep slopes. Windrow placement with non-slew loaders loading in-field on flat land. Richard Cole 40 000 Sezela Hilly, steep in places Manual green cane harvesting. Stack for side loading trailers. Zunckels 28 000 Darnall Mix of steep and flat Cut and Stack Reduce ash content. KwaMbelu 47 000 Sezela Mix of steep and flat Cut and Stack Gradients. Jeremy Cole 20 000 Sezela Mix of steep and flat Cut and Stack Reduce ratoon damage and soil compaction. B: Cut and stack A: Contractors method. Lourens Agri 70 000 Komati Flat Windrow placement with slew loaders (excavators) loading in-field. Changing to mechanical harvesting. Contractor handles harvesting and loading currently. Grant Taylor 16 000 Komati Undulating Windrow placement with slew loaders (excavators) loading in-field Contract harvesters. Advantages: extra payload, quicker loading, can push lorries in the wet. Disadvantages: stool damage from push piler, compaction from truck, one needs 20 m roads for truck to turn. Turning loader at end of lines causes road damage. Low bed to transport loader. We can see that Cut and Stack requires the least investment in capital equipment, has the lowest running costs and, if your focus is on maximising future yields, it is the winner here too. It does, however, require more labour and, with the lower intensity of mechanisation, comes lower efficiencies. 13 of our top farmers are using this method exclusively, most of them for the preservation of subsequent yields and because their land is too steep for any other method, but some for the employment opportunities it provides. All of them are KZN-based. Cut and load in-field with non-slew loaders carries the highest cost for future yields but the equipment requires relatively reasonable capital investment, affords high levels of efficiencies and cuts back on some labour requirements. Still loading in-field but using slew-loaders requires slightly more capital investment and the running costs are marginally higher but it saves substantially on yield loss in subsequent harvests. 10 of our top farmers are loading with in-field grabbers – mostly because they can (their land is flat) and because the efficiency of this system appeals. 3 are combining cut and stack with in-field grab loaders, all these farmers are taking their cue from the terrain. Mechanical harvesting requires almost no labour but the cost of the equipment, the running costs and the yield loss is worth noting. That is why this option is only viable when the equipment is fully utilised, thereby maximising efficiencies of scale. At Lourens Agri, they believe this point is in the region of 70 000 tonnes annually. Maximising efficiencies. For Nick, “yield on the field being cut determines everything.” So, while I have been focusing on maximising the yield of the following crop by minimising ratoon damage and soil compaction, the yield on the current crop is also important simply because higher yielding fields can be harvested more efficiently than low yielding fields. When Nick offers his contracting services, he faces the challenge of being able to do the job cheaper than what the farmer could do it himself, otherwise, there’s no point. He can only do this if he maximises efficiencies. This is easier if the yield is higher. So, Nick charges based on annual yield rather than on area harvested. 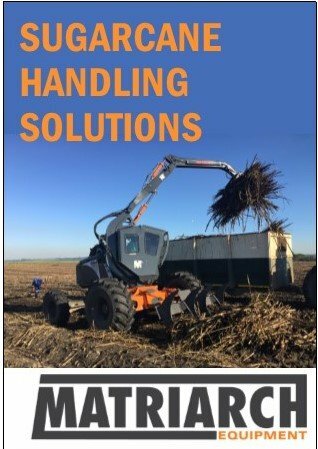 The learnings we can take from this is that, once you’ve chosen the cutting and loading system that will best suit your operation, maximising efficiencies is vital ie: the equipment, staff and other facilities must be utilised fully in order to attain the lowest possible cost per tonne of sugarcane. If you can’t, because your operation is too small, then you might need to go back to the drawing board, or hire a contractor. High cost of inefficiencies. Nick has costed all his options and, while he acknowledges that Cut and Stack wins when it comes to minimising ratoon damage, soil compaction and ‘dirty cane’, he believes that he compensates for this by ripping the fields every 4th ratoon and gapping when necessary. His calculations assure him that the efficiencies of loading in-field into trailers that ultimately go straight to the mill with no double handling of the cane make up for any cost the heavy traffic has on the crop and soil in future harvests. I hope this article has shed some light on the complexities of choosing the right operation and equipment to suit. If not, let me know how I can do better. I really do want to bring you articles that make sugar farming easier. Suppliers of the equipment profiled. SugarBytes Top farmers who confirmed their operational methods for the table. Chris Gemmell for initiating this topic of discussion – bring on another one Chris.